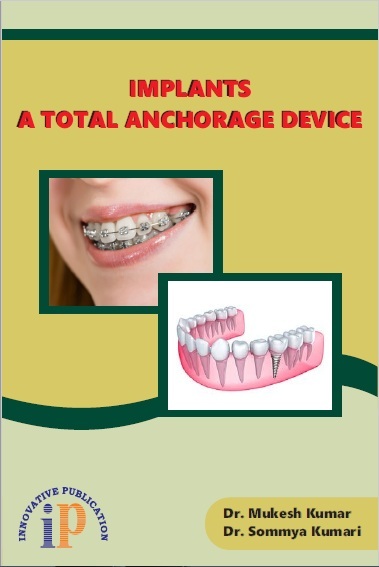 This first edition of the book Implants – A Total Anchorage Device is now respectfully presented to the seniors, colleagues and the postgraduate students of orthodontics. A comprehensive manuscript of the recent advancements is always awaited. And is more difficult to gain a thorough insight about the topic which has got a very few pages in the text books. Therefore, this book was compiled to provide a thorough insight to the most recent topic in the speciality of orthodontics and dentofacial orthopedics. It was really difficult to write the book, but the guidance and blessings of mentors was always next to me to reach the goal. It is confidently believed that this book will furnish the necessary information essential to successful orthodontic implant handling. While the difficulties are likely to be encountered in the clinical practice, but I have recognized the potential problems and presented here a detailed clinical description. All the chapters have been carefully designed and described as well. The figures in each part have been carefully labelled, being suited to a very young clinician, Whose time is limited. This book itself is a complete clinical guide to success. Dr. Mukesh Kumar has done his schooling from Bihar with a very good academic records, and was ever willing to write books. Dr. Mukesh has done B.D.S. from Manipal College of Dental Sciences , Mangalore in the year 2006 and was awarded prize for outstanding performance. Dr. Kumar has served Mithila Minority Dental College and Hospital, Laheriasarai, Darbhanga, Bihar as senior lecturer in the Department of Orthodontics and Dentofacial Orthopedics. Currently Dr. Kumar is working as Assistant Professor in Department of Dentistry at Vardhman Institute of Medical Science, Pawapuri, Nalanda, Bihar. Dr. Sommya Kumari being very keenly interested towards academics had a very good educational carrier to her credit. Dr. sommya completed her bachelor of dental surgery from rural dental college, loni and is presently persuing post graduation in the specialty of prosthodontics. She always endeavored to guide and make the topics easier for herself and for colleagues as well. A continued praise, support and demand from the seniors, colleagues and juniors strengthened her to write a book. She has actively participated in various continuing dental education programs and is running her own clinic in patna.